Dubai (UAE): The Standard Chartered Dubai Marathon, the world’s richest long distance running event, has joined the athletics elite following the announcement that it has received Gold Label status from the International Association of Athletics Federations (IAAF). 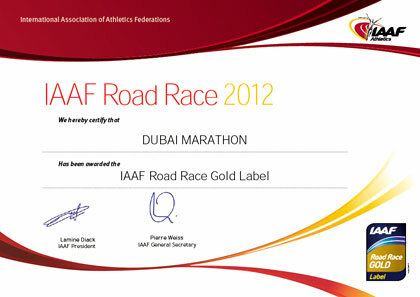 It is not only the first time a Middle East-based running event of any kind has gained IAAF Road Race Gold Label status – making it the highest accredited in the region – it also firmly establishes the event’s credentials as the number one marathon in Asia and places Dubai in the sport’s top division alongside cities such as London, Berlin and New York. “It is a big honour for the Standard Chartered Dubai Marathon to be up alongside the major marathon venues,” said event director Peter Connerton. Held under the patronage of HH Sheikh Mohammed bin Rashid Al Maktoum, Vice President and Prime Minister of the UAE, Ruler of Dubai and held under the aegis of the Dubai Sports Council, the Standard Chartered Dubai Marathon has consistently attracted the best young talent in distance running as well as the undisputed king of the sport Haile Gebrselassie. Such has been the quality of the elite fields competing in the marathon itself and the results achieved, the event is currently ranked sixth in the world of all marathons after London, Berlin, Chicago, Boston and Amsterdam. Ahmed Al Kamali, President of the UAE Athletic Federation and Member of the IAAF Council, also said it was a great honour for Dubai to have been awarded this recognition from the sport’s governing body. Over the years the organisers of the Standard Chartered Dubai Marathon have worked with various Dubai government departments to take the event to even greater heights.